Now that the Summer heat is finally here there is nothing better than a delicious glass of iced coffee…..unless of course I’m having a cocktail, but that’s a different post! The perfect glass of iced coffee is really rather simple to make, but it does require three distinct elements. These three elements make the perfect glass of iced coffee because each element adds something to the flavor of the coffee. 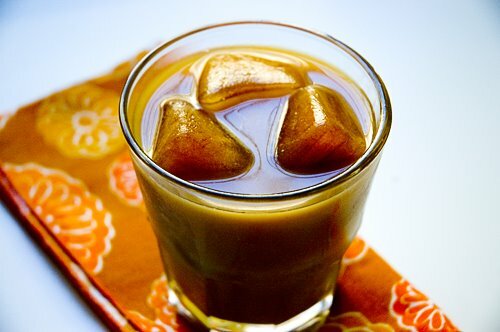 Coffee ice cubes prevent the drink from watering down as the ice melts, ensuring that your drink stays potent and cold. And finally, simple syrup ensures that the sugar dissolves into the coffee. There is nothing worse than sugar granules that don’t dissolve and sink to the bottom of the glass. In a french press, stir together coffee and 1 1/2 cups water. Cover and let rest at room temperature overnight or 12 hours. Push french press plunger down to strain. In a tall glass filled with ice, mix equal parts coffee concentrate and water, or to taste. Anita…I know huh? I keep a tray in my freezer…refill it with left over coffee from the morning! My mom was so ahead of the iced coffee times. She was rockin' the coffee ice cubes in the early 80's…hand to God. It's genius! your photo makes me want to go out and grab a drink immediately. Thank you. 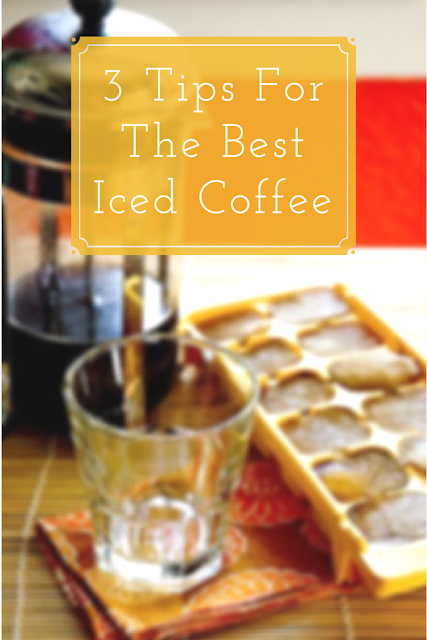 My favorite is the coffee ice cubes, it really made my iced coffee go from okay, to great. awesome. I just set up my french press for cold brewed coffee in the morning. Yay! I agree with all of you…I personally think using the french press and coffee ice cubes is the best part! Anyway, I found you through Tastespotting and wanted to personally invite you to check out my new site which is devoted to food photos which have been rejected from the other sites. You'll find the address below. I hope you swing by and check it out; it's a lot of fun! thanks casey. Make sure you show your husband the NY Times article…there's a link to it in the post. HUGE difference in cold brewing. the main difference is that the heat from hot water causes the bitter taste in coffee. when you cold brew, the bitter taste is eliminated! Yes, word on the condensed milk, that is so delicious, I use it hot coffee as well. Just a suggestion for those interested… try some Single Origin Ethiopian Harrar for iced coffee drinks (Archer brand at Target is readily available, for example.) It is very smooth and unlike some coffees tastes even better as it's temperature drops! @tastestopping — there are definitely some reactions that occur & volatiles released when the heat reaches certain temperatures, and they all go toward making the perfect smelling & tasting cup of *hot* coffee… and aren't really necessary for a cup of cold coffee. Hmm… I've never tried heating up a cup of cold-brewed coffee to see how it compares to a hot-brew. This looks like my kind of summer drink! It’s just like how I make my hot coffee, minus the ice. Now that it is so hot out, I’ll have to try this cool version. Beautiful pictures too. Thanks for sharing. My friend taught me how to do that iced coffee. It tastes good just like that one in the picture. I've never thought of making such an iced coffee. I'm just glad you shared this recipe to us. Thanks! Thanks for this awesome tips and advice. I'm a big tea drinker and I'll surely try your advice. « Anatomy Of A Killer Tostada!